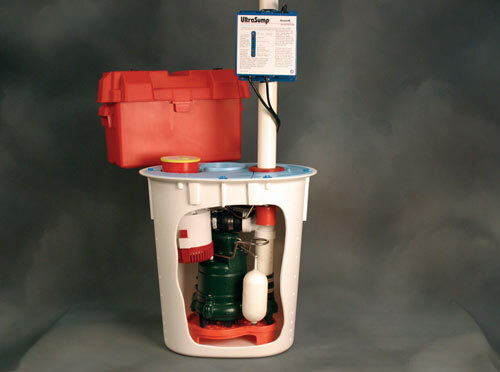 The SmartSump™ has a high quality Zoeller 1/3-hp cast-iron pump, with automatic float switch. 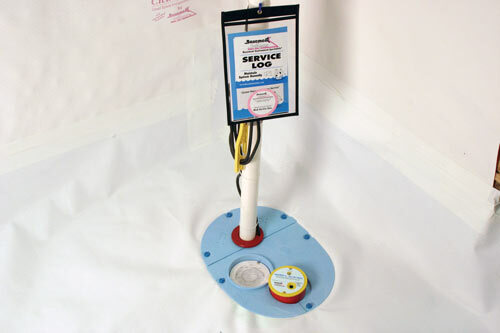 The lid and unique SuperLiner® sump pump basin are designed to accept the CleanSpace® crawl space vapor barrier system, for an airtight seal. 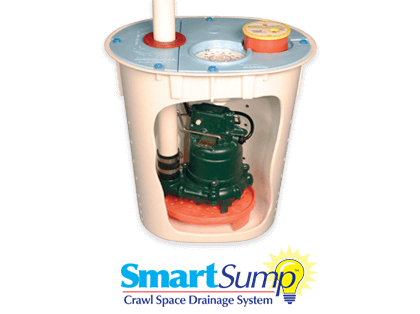 A sump pump Basement Systems' SmartSump™ sump pump system is specifically designed for crawl spaces to help reduce moisture, remove water and prevent flooding. 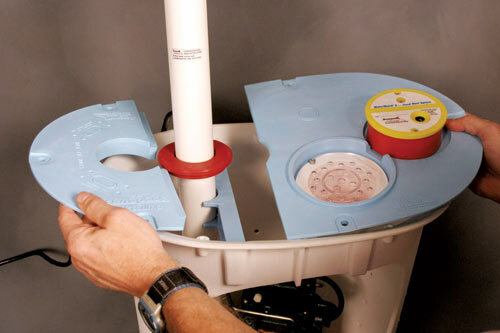 The SmartSump™ has a unique sump pump cover design, so water from a plumbing leak fills an alarm pocket on the lid first, sounding a WaterWatch® alarm that will let you know there is a plumbing leak. From there, the water flows down a special airtight floor drain that will let the water down, but damp air cannot come up into your crawl space. The WaterWatch® sump pump alarm also alerts you to pump failure for any reason, including power outages. The SmartSump™ liner lid also has a built-in knockout to accept a dehumidifier hose. 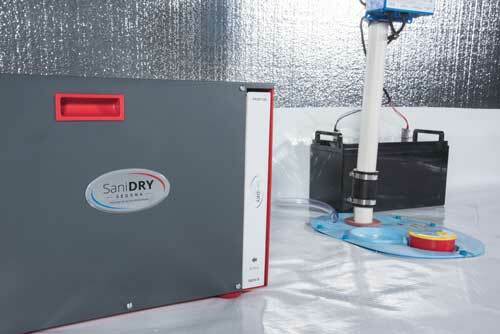 The pictured SaniDry™ CX, a crawl space dehumidifier and air filtration system, works in perfect unity with the CleanSpace® system and the SmartSump™ crawl space sump pump system. SmartSump™ is only available from a certified installer in your area. Contact us to request an inspection & get a free cost estimate to have it installed in your home. The SmartSump™ is available with or without an optional UltraSump® battery back-up system. The UltraSump® has a second pump in the event that the primary pump fails, a second switch in case of switch failure, and a second power source in case of power failure. 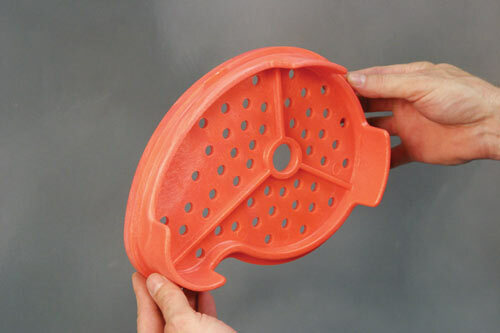 This protection is optional, but highly recommended, and is just another reason to install one of our industry-leading sump pumps in your home. Contact your local Basement Systems dealer today to learn more about how our SmartSump™ or other waterproofing products like the TripleSafe sump pump or SuperSump® sump pump system can make your wet basement a thing of the past! 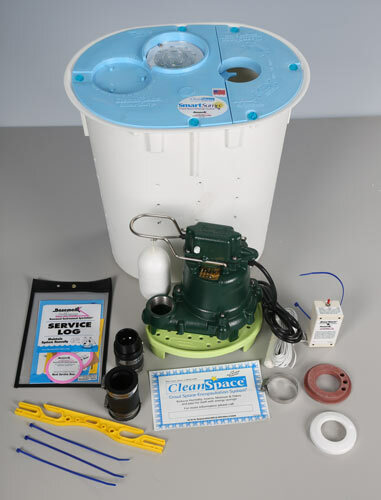 Or find out more about how we install and replace sump pumps systems.